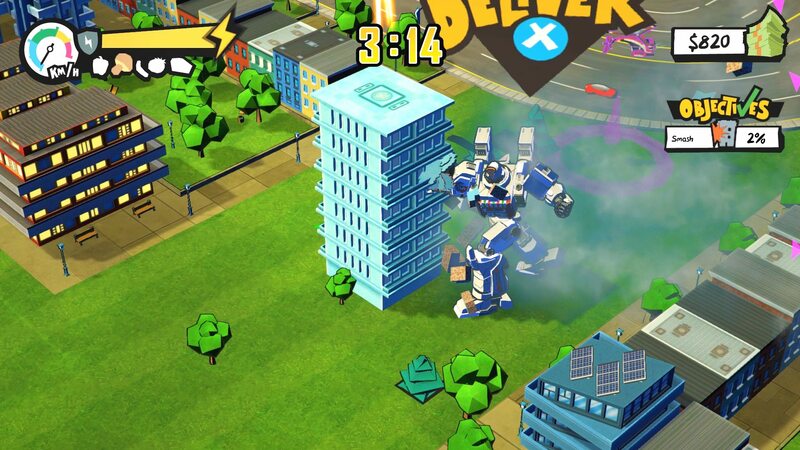 It’s been almost two years since my initial coverage of Pizza Titan Ultra, a game in which players are tasked with delivering pizza… using huge mechs. Because why not? Fast food delivery can be quite the dangerous business after all, so best to be prepared; and that goes double for these as for some reason, simply ensuring the slice(s) of heaven reach the customer is never enough. There’s always something else to take care of at the same time. Always. Typical. Oh, and for those in need of a plot of sorts: Cheezborg, once pizzaria mascot, now “deranged robot overlord”. There. Now back to the pizza deliveries; while crushing his puny army, of course. Ah right, almost forgot to mention that players will also be able to customize their mechanized saviours of hungry people all over the city? Hopefully it’s a big one, because bigger is always better when dealing with pizza. Although as it turns out, size aside, we won’t get to simply go all out and demolish the entire place in every single one of Pizza Titan Ultra‘s thirty-two missions. Bit of a shame, but eh, the focus is on pizza, not mayhem, even if there will be exceptions. Such glorious exceptions. Also, better be more than enough pineapple toppings, or the city shall be leveled, mission objective(s) be damned! PIZZA GOOD! Pizza Titan Ultra will be available on Steam at a TBA date with a TBA price tag.